View our Spring 2019 courses! Improve your computer skills, learn about something fun and new or advance your employment opportunities. Would you like to teach a course or do you wish a certain course was offered? We want to hear from you. Call us at (567) 661-7357. View our Summer 2019 courses! 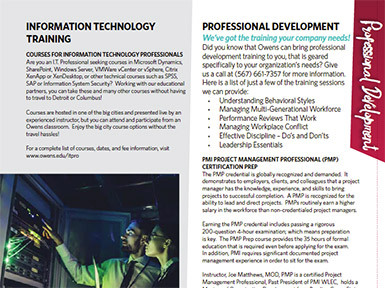 Did you know that Owens can bring professional development training to you, that is geared specifically to your organization’s needs? Give us a call at (567) 661-7357 for more information. Motorcycle Ohio Registration Available Online. — Click on Basic Rider and register under Wood County for Owens classes. REGISTER NOW at motorcycle.ohio.gov or call Owens at (567) 661-7357 for assistance. Online Courses — View information about our online courses. We offer four easy ways to register.